First Solar’s (FSLR) upcoming earnings announcement presents us with a unique opportunity smart option traders won’t want to miss. FSLR is scheduled to announce their quarterly results January 30 after hours. First Solar is one of those stocks that is the volatility traders’ dream. Check out what has happened on past earnings reports in the table below. Never has the stock moved less than 10% on the day following earnings, sometimes moving as much as 18%. This is a huge move for a NASDAQ stock enjoying such ample volume of trades to feature low bid/ask spreads and weekly options positions. With such huge price movements not only possible, but even likely, it is not surprising to see that options volatility spikes about a 7 to 10 days before the earnings announcement, as long positions and short sellers scramble to insure themselves against adverse movements. This is shown in the chart below, with the volatility increasing from 70% to 150% just prior to earnings. Investors with a stake in FSLR want to buy the cheapest insurance possible. Those are represented by options contracts that expire the day after earnings, in this case on January 31. As I write this, the stock is trading at $51.20, and buying a collar – buying a 52 strike call and a 51 strike put – sets me back $3.71 per share or $371(plus trading fees) for 1 contract. With FSLR usually moving at least 10% on option trades, speculative investors might want to just do that and wait out the earnings report. As long as the stock moves by more than $3.71 cents or 7 percent, they could make money. On a big move, 18% say, they could make a lot of money. Look at the last earnings report – odds look excellent that this could happen. But what if this time it doesn’t. ( Remember our good friend Murphy?) Look at the delta (time) factor. These options lose about 10% of their value EVERY DAY! In a week’s time, they will have lost 60% of their value. By they day before earnings, they will have lost almost 99% of their value to time erosion (barring increases in volatility – or vega). So any move less than 7 percent can result in a loss of almost all premium. So yes, you can double your money in two weeks. But you can also lose it all if the stock moves less than 7%! That’s not a gamble I like to take. At least Las Vegas offers free drinks and pretty girls. Here’s a better approach, that makes time work in your favor instead of against you, and doesn’t care whether the stock price moves up, down or sideways! The Fed meet today and tomorrow to determine whether or not they will begin “tapering”, a euphemism for ending the $85 billion of money printing they have been doing every month in a desperate attempt to revive the sluggish US economy. Most economists believe inflation figures are too low for the Fed to begin tapering this month, but a full 38% of those polled do see an immediate tapering. I believe there will be a postponement – consider it a Christmas gift to the stock and bond markets – but I’m not confident enough to bet on it! However, I’m more certain about uncertainty, if you’ll pardon the cheap pun. I foresee a continued increase in uncertainty or volatility, peaking tomorrow afternoon at the time of the Fed statement. and if the price of the index remains stable, moving only in a tight range. The Sky is Falling ! The Sky is Falling ! Last week we made an option play betting uncertainty would rise into the congressional battle over funding the government over the next quarter. As you know, neither side flinched in that game of chicken, and the US government went into partial paralysis. Look over the last trade: we did pretty well making about 3 times as much money as we were willing to risk, in about four days. Guess what? Not much has changed, but now the stakes are higher. If Congress cannot come to an agreement by October 17 over extending the debt limit, the US government will come to a screeching halt. Economists worldwide are in virtual agreement that this would provoke a worldwide crisis larger even than the 2008 Lehman meltdown. For that reason, most people, myself agreeing, don’t think it will happen. At the last minute, given what is at stake, one side or the other – in this case the Republicans – will flinch and give in, and a compromise will be found kicking the can down the road for another six months. Democracy at its finest! But when you are talking about the clash of politicians’ vastly overinflated personal egos, enormous sum of money, and lifetime political careers hanging in the balance, as my son would say : “S(tuff) happens”. Take another glance at the volatility index. If my son’s deeply nuanced philosophical words are right, I think there is a very good chance that the VIX will breach its ceiling at 22.50 and rise to the levels indicated in yellow, between 27 and 45. I would say the likelihood of that happening between now and October 18 is no more than 50%. But I do think the VIX has a better than 75% chance of going over 22. Access is restricted to registered members. Register for a FREE 60 day trial today. There is no initial cost to try out the service, so join today! Ok, here we go for another round of Russian roulette in Congress, with the congressional budget talks at stake. Without an agreement before October 1, a huge array of government services would cease—from processing veterans benefits to cleaning up toxic waste—and all but the most vital government personnel would stop coming to work. With no clear path toward a compromise between Democrats and Republicans, the question isn’t whether we’re going to have a government shutdown, but how we’re going to manage to avoid one. While the deadline for resolution of this impasse is looming – September 30 – prospects for a compromise solution are looking increasingly unlikely. Whether Congress allows the deadline to pass without a new budget – or politicians allow for a solution at the last minute, either way, I think we’re in for a sharp rise in uncertainty. I expect this will be reflected in options prices for the VIX volatility index. Take a look at the VIX’s levels over last few years. 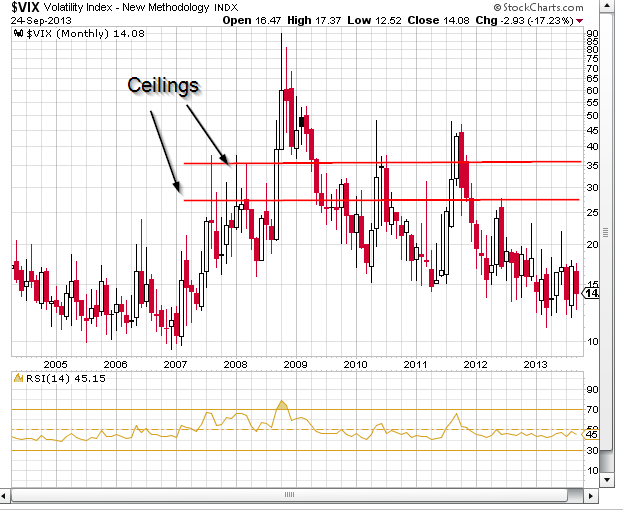 The VIX is currently still trading at a level – that in my opinion is unnaturally low. I personally think the politicians will work something out in an 11th – hour solution, but not before their backs are put to the wall. So, just as in the past, I expect a short term jump in volatility. There is a ceiling around the 26-27 level, which I do not think we will breach. If politicians cannot come to a compromise and increase the macroeconomic risks in the debt-default talks of December, that might be something likely to send volatility to sky high levels and test the next ceiling at 48. On the low side, I do not think the VIX will go much below its current low around 13.50. For it to drop back down to the 2007 lows around 11 I think we would need a grand bargain among politicians concerning government spending, entitlements and the long term debt. Unfortunately, I do not see that anywhere on the horizon. Tesla Motors (TSLA) is probably one of the most popular success stories on the stock market for 2014. Since its debut in July of 2010 at $17, the stock has never had to look in the rear view mirror. Last August, Elon Musk, the company’s flamboyant CEO surprised investors and analysts with better than expected sales figures and earnings on already ambitious growth plans. The stock promptly shot up again in the gravity – defying move to today’s $190 level. That’s kind of the way I feel about Tesla right now. So I’ll show you two quick ways – using options – to profit from that situation, with limited risk if you are wrong and Tesla shoots to the moon or drops like a rock. Ok. It’s January 3, 2012, the champagne’s has long since lost its fizz, my head has started to re-assume non-pumpkinlike dimensions, and its time to evaluate how we did last year. I just read in today’s Wall Street Journal that the average hedge fund was down 3.7% for the year, according to data published by Hedge Fund Research. That about matches the NASDAQ, which ended the year down 1.8% but underperformed the DOW, which ended up 5.53%. How did our performance match that? Well, we blew them out of the water. Our three stock sample portfolio grew from 100K to 148K in 9 months, about a 60% return. Our 6 stock portfolio, which ran for less time, started in June of 2011. Due largely to the extreme choppiness of that summer period – which wreaks havoc with most trading strategies, including ours – this portfolio showed a bit weaker results, but certainly nothing to complain about. Our 100K June portfolio has grown to 118K or 32% on an annualized basis. Not too shabby. Lessons learned in this year’s trading? First and foremost, be patient! When the summer whipsaws were punishing our trades, it was important to hold on for dear life. By doing so, we benefited handsomely when the market finally made up its mind. The secrets of our strategy? 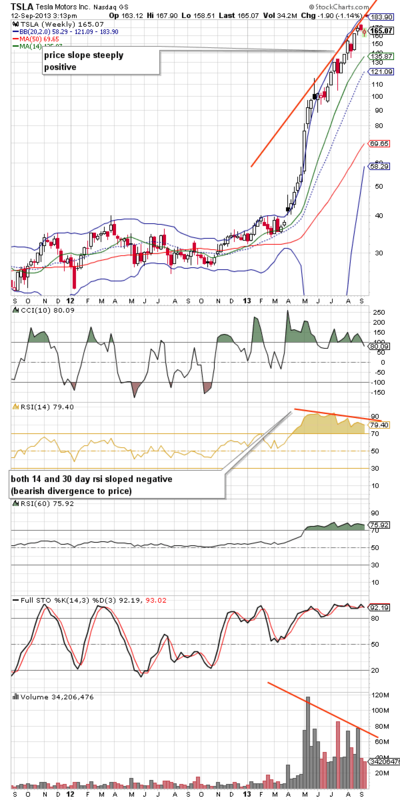 Use a momentum indicator – we like the Commodity Channel Index, and stick to it fairly religiously. We may get a series of losses – 2 or 3 in a series are not unheard of – but then the subsequent gain usually more than makes up for that. So we use put options to attempt to gain value as the equities are falling. Well, our options portfolios performed poorly compared to long / short no option strategies. In analyzing our results, we ascribe this to 2 mistakes we made. First, we traded options with expiry date only 1 month out. This time frame proved to be too short, and we got killed by time decay. Time erodes the value of all options (Theta), and the shorter the option the greater the decay. This will erode the value of your position, even when you are right in the direction of trading. Second, in the stocks we chose to follow, the bid-ask spreads on my options were too large. If you are trading a stock and your momentum indicator signals you to reverse your trade – which will happen with frequency – you usually suffer little damage – perhaps a 30 to 200 basis point drop plus whatever friction results from transaction fees. On an option however, if you buy the put option then immediately sell it – with no movement of the underlying equity – you may see yourself sitting on a 10% loss due to the spread between bid and ask. Only go long, use your signals to get out at the appropriate times. Use reverse ETF’S on sector ETF’s or broad market indices (e.g. QID) in lieu of the put on a given stock. Extend the expiry period of your put options – and only trade options that feature a spread of less than 2 percent. When option volatility is high, use straddles, strangles and calendar spreads to be a net seller and not a net buyer of the high priced options. We believe the final choice will be the most successful, as our limited backtesting reveals, but the real proof of the putting will be in the eating. Once again, the technicals triumphed over the fundamentals. Look at my featured trade posting of last week. I love this company, and its position in the interplay of world commerce. Sales and earnings are soaring, so you could easily be bullish about this company’s long term prospects. But the psychology of the market was screaming “SELL”. Let’s face it, the public is downright scared. This was reflected in APKT’s chart, as I showed you. Look at my featured trade. I had said I would sell it short if the stock traded below $54.20 with a limit price of $54. I got in at $54.15, on the short side, and had to hang on for a fast toboggan ride down to $40. When it bounced up from here, I exited the trade, because that was where I had perceived a weak floor to be (see my posting). So far so good: a quick 17 percent in less than two weeks. And we are not done. I was looking for a small bounce at $40, up to a previous low. That low was at 45. So when the stock turned south there again, I was back on board, with a short at $42.50. the stock is now trading at $39.92 at close on Friday. I have a stop position at 41.90, which will give me a small loss if it triggers. I expect the stock to sink lower to at least $35, before it encounters another bounce. Long term, technicals look pretty dismal for this stock. I expect a short term move – within the next two weeks – down to the floor around $30. A bounce there probably will be nothing more than a “dead cat bounce” , as this animal is expending one of its nine lives. Does this have to happen? Of course not. Be cautious and use stop limits to limit your losses if the market surprises you. As always, remember never to trade more money than you can afford to lose. By nature, trading in stocks is risky. Make sure you read our disclaimer. Good luck! Is ACME Packet Headed Lower? What a run APKT has had in the last year, up more than 500%. While it still has wonderful fundamentals, beware of the technicals. Check out today’s featured trade. What a wacky two weeks its been! Sorry I’ve neglected you readers this long. Sometimes though, a man’s just gotta make a living! These markets have been roiling so heavily, that I barely had time for lunch. Hopefully most of you have taken a glance at my portfolios. If anybody has ever had any doubts about whether trading beats a buy-and-hold strategy, take a glance at this year’s results to date: My 3-stock portfolio is up by 41% since last March, which translates into a 98% annualized return. Just in case you think its pure luck, look at the 6-stock portfolio of growth stocks (and the QQQ index): in two months, it’s grown 21%. If I can keep that pace for a year, that would yield 118%. By the way, I finally got around to adding the growth portfolio to the web site. Just click on the “Portfolio Tab” , then towards the bottom of the page you’ll see the link for growth stock portfolio (6-10 stocks). Similarly, to view the trading history for it, select the “Trade History” tab, then at the bottom look for the link to the Alternate Growth Portfolio History. If you peruse the history a bit, you’ll notice something that may strike you as very odd: in absolute numbers, I lose money more often than I make it. But this is more than offset by the size of my gains when compared to that of my losses. This particular strategy will always do that: I get 2-3 small losses, usually in the 1-3% range, followed by 1 big gain, usually in the 5%-25% range. Then the whole process starts all over again. So far over all times frames I’ve tested it, this has been the pattern through flat, bull and bear markets. Of course I would love to eliminate the losses, but so far, whenever I try to tweak the system to reduce these, I end up lowering the overall performance. I’ll keep on tinkering with it, but in the meantime, I’ll learn to live with the frequent small losses, as long as I get the big number at the end. A number of my readers have commented on the few stocks featured in our portfolio. Let me explain that. I follow and track hundreds of stocks that meet my quality criteria, but I believe excellent results can be obtained with very few stocks. I am currently deploying three different trading strategies, one of which is posted here. It consists of using daily time periods as the units of measurement (referred to as “candles” in technical jargon). Basically I am relying on specific technical indicators to provide me with a signal as to when to go long or when to go short. This particular strategy consists of always being in the market in those securities, and never on the sidelines. Hence, there is always money to be made – or lost, as the case may be. It’s easier not to miss signals if you follow fewer stocks. I have another portfolio which deploys the same strategy, but does so on up to 20 stocks at a time. In principal, this should smooth out the results, and give me more consistent results. I’ll be posting that strategy online a little down the road. Keeping this blog up to date takes time, and meanwhile, I’ve got to run my business.